Although I write about communicating in a visual manner all the time (see 5 Steps to Slide Design for Non-Designers, for example), sometimes it becomes clear that certain presenters will never get there. I’m working with the organizer of a conference for physicians. The organizer has asked them all to use PowerPoint, but since many of them have never used it, they’re handing in their notes and expecting to receive a PowerPoint presentation ready to use. Maybe a background will be designed for everyone. Someone is pouring the text into PowerPoint. The question came up about how to easily animate bulleted text for the entire presentation so that it comes in line by line. The direct answer is easy: add the animation to the Slide Master. Whew! That saves a lot of time animating each slide for a dozen presenters! But because I don’t recommend a presentation made up of bulleted text, it’s hard to make that suggestion. Another concern is that animating bulleted text has both advantages and disadvantages. The advantage is that it keeps the audience focused on what the presenter is saying; otherwise, they tend to read ahead. 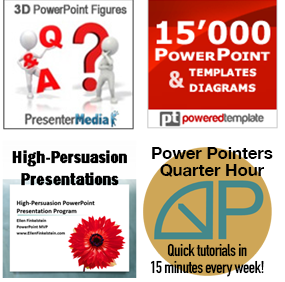 Some audiences are frustrated when they don’t know which point the presenter is discussing. The disadvantage is that the audience loses the wholeness of what the presenter is saying for that slide. It’s like spoon-feeding the audience, bit by bit, and many people don’t like it. Here’s an alternative: presenting all of the text at once, but then changing its color, line by line. As the presenter clicks, each line’s text color changes. And you can do this on the Slide Master, too. Press Shift and click the Normal view icon at the bottom of the screen to go into Slide Master view. 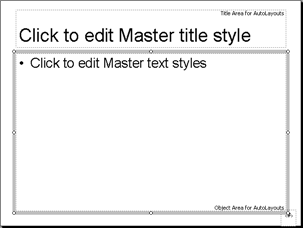 Click the border of the text placeholder to select it. 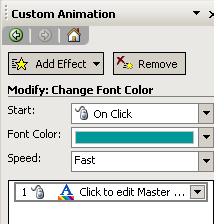 In the Custom Animation task pane, choose Add Effect> Emphasis> Change Font Color. Click the Speed drop-down list and choose a speed. I found the default Medium to be too slow, so I changed it to Fast. Insert a slide with some bulleted text. Test the animation in Slide Show view. All of the text appears on the slide at once, but each line changes color as you click.